For over 30 years The Popcorn Factory has been delivering every flavor of popped corn you can imagine. They source all of their corn from areas around the United States, and they cook the kernels in 100% corn oil. 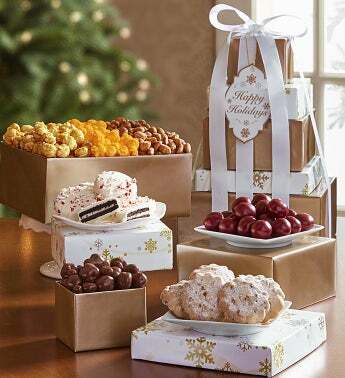 They have a variety of products including towers, gift baskets, custom flavors, and holiday arrangements. All of this activity leads them to pop more than one million pounds of popcorn per year, and some of their varieties even come gluten, kosher, and sugar-free. 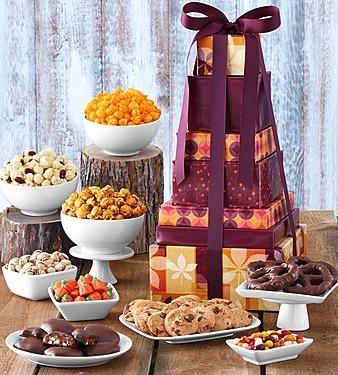 A retailer for the popcorn lover and those looking to gift gourmet arrangements and towers. We have never seen so many flavors of popcorn. There are 33 popcorn flavors to pick from including the obvious butter, cheese, caramel, and white cheddar varieties. Some of the other more exotic flavors include jalapeno, peanut brittle, cinnamon, and holiday treats including s’mores, peppermint bark, and holiday cookie. 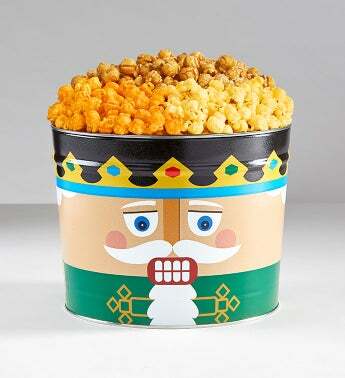 These gourmet popcorns come in traditional tins, towers, gift baskets, and even tins modeled after sports teams. 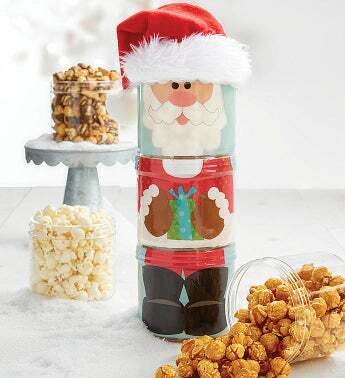 Popcorn Factory also offers some other products like chocolate, caramel, pretzels, cookies, candy canes, and fruit sours to name a few. However, we didn’t see any beverages offered on the site. Some other offerings include popcorn balls, more specifically the caramel chocolate-dipped popcorn balls which look like caramel apples. Overall Popcorn Factory has good variety, but they need beverages and a few more options for a better score. Popcorn Factory does have customization options. You can choose three of your favorite flavors and have them all packed into one tin if you like. Customers can also get massive 3-6 gallon tins of their chosen flavor sent to them too. It would be nice to design your own basket, but unfortunately all customers can do is choose their own popcorn flavors. Despite this the list of tins and gift baskets are extensive, so there’s more than likely a product already available that would suit your needs. Popcorn Factory does well in this section. Among some of the holidays they celebrate are Christmas, Hanukkah, Thanksgiving, and even birthdays. They also have college gifts, get-well-soon packages, and what they call “snack-to-school” gifts. The big reason they do so well in this category is the gluten, sugar, and trans-fat free options that they have. They’re also sensitive to other groups as well, offering Kosher and Vegan options. Basically all of their popcorn flavors are gluten-free, which comes as goods news to those who love popcorn. Overall Popcorn Factory gets stellar grades for this section. 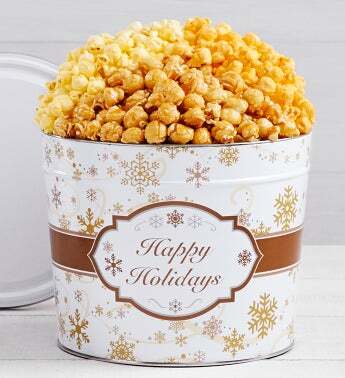 Popcorn Factory has many different avenues for those seeking the perfect corporate gifts. Among the packages include those dealing with sales promotions, customer loyalty, birthdays, thank-you notes, and employee recognition. They offer a volume discount to businesses that want to order a special gift for their employees. The discounts go anywhere from 5-20%, and corporations can even call in and negotiate custom gifts for their particular needs. You may call Popcorn Factory at their toll-free number (1-888-216-0235) or contact Popcorn Factory at orders@thepopcornfactory.com. These values are only valid before shipping and handling. On average the popcorn tins cost anywhere from $34.00 to $94.00, with most of them coming in between the $40-$50 range. Concerning gift baskets, the smallest gift basket goes for $34.00, and the largest gift basket costs upwards of $179.00. There are only seven different gift baskets though—most of the variety comes in the form of the popcorn tins. 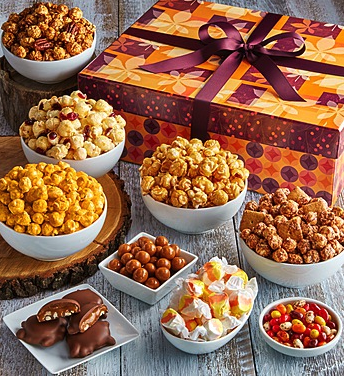 The snack assortments will cost anywhere from $30.00 to $79.00, and the unique popcorn ball selection goes from $14.00 to $39.00. If you’re looking to purchase products in the “big 3” from Popcorn Factory (tins, popcorn balls, gift baskets), you’ll probably be spending $30-$50. Popcorn Factory does guarantee the delivery date, but only if you use the overnight option. They do target your delivery date without the overnight selection, but things like bad weather and international shipments may interfere with the speed of the arrival. They ship via UPS and the United States Postal Service. Ground – Prices vary depending on the amount of product purchased, but expect to pay anywhere from $6.99 – $21.99. Two Day – Standard shipping plus an additional $9.99 per item. Overnight – Standard shipping plus $19.99 per item. Saturday Delivery – Standard shipping plus $24.99 per item. Popcorn Factory does deliver to all 50 states, but delivery to Alaska and Hawaii face a $7.99 upcharge. They also deliver to Canada and internationally, but the process will take 1-2 weeks for Canada and 4-6 weeks for international locations. 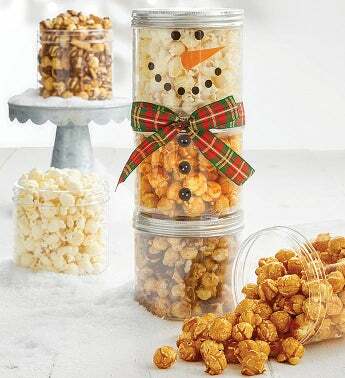 Popcorn Factory’s products come in a variety of tins, towers, and baskets. For instance, the tins can come decorated with the logo of your favorite NFL or MLB teams. The towers are especially beautiful, wrapped with a hand-tied bow, having many tiers of freshly popped popcorn. The displays are stunning, and Popcorn Factory takes great pride in offering up great-looking packages. There is a 100% customer satisfaction guarantee, meaning that if there’s any problems with the package customers can request to have another one sent free of charge. Popcorn Factory has robust customer service options. If you want to get in touch with them, you will. Try the toll free number at 1-888-238-8107 or their email address: orders@thepopcornfactory.com. There is a detailed FAQ page as well as the opportunity to chat live with an agent. When I called in to request information, I was greeted by a knowledgeable and wonderful staff, and I only expect they act this way towards everyone who calls. Under $50 – Most of Popcorn Factory’s products are under $50, which is good for you and your wallet. All tins under 6 and a half gallons are also under $50, including the themed tins with sports teams imprinted on the outside. As far as towers are concerned, a few of the Christmas-themed towers are $49.00. Three gift baskets fall under $50, including the chocolate lovers basket and autumn basket. Almost all of the snack assortments, which include popcorn, pretzels, peanuts, and cookies are under $50. Every single one of the popcorn balls are under $50. $50 to $100 – All of the larger, 6 and a half gallon popcorn tins are $54. Most of the towers come between $50 and $100 as well—which is still good for the wallet considering what you’re getting. Some of the gift boxes including the “Thank-you” gift boxes and “Big Happy Birthday” boxes are priced above $50. $100 to $200 – Some of the bigger 8-tier tins come in between this range. The deluxe gift basket, which includes popcorn, peanuts, beans, and cookies costs $129, while the “Simply Large Willow Basket” costs $179. Popcorn Factory is for those that have a particular affinity for gourmet popcorn with a ton of flavor varieties. They do offer other side items, but this site is straightforward about what it offers—and that’s popcorn. For those that are tired of overcooking popcorn in the microwave and want better, this is the retailer for you. There’s a lot to love about Popcorn Factory. They offer so many varieties of popcorn that I’m starting to think movie theatres are doing it all wrong. Their pricing of the products is also phenomenal. 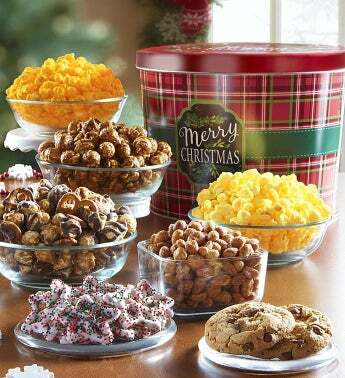 You can have a pretty large package of gourmet popcorn for under $50, along with other gift baskets and towers. We also like their sentiments and theming. They are pretty inclusive of all holidays and diets, including gluten-free and kosher varieties. Their corporate discounts are also better than most others. We understand that Popcorn Factory does popcorn well, we just wish that they could do other things too. They offer pretzels, candies, and even cookies, but that’s it. When we’re dealing with popcorn though, these are the best pairings. More customization would have been nice too. All you can customize are which three flavors you want in a tin. It would’ve been nice to have some more options rather than just popcorn. 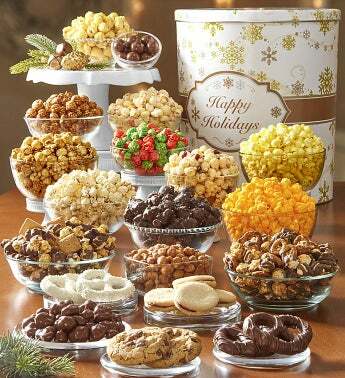 Popcorn Factory focuses on gourmet popcorn and other complimentary foods such as cookies, candies, and chocolate pretzels. 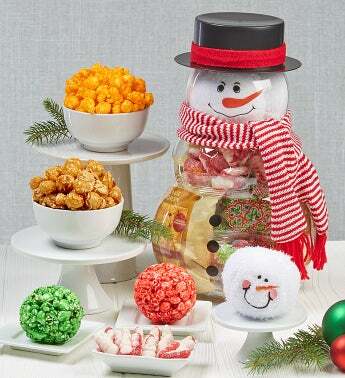 Overall, Popcorn Factory is a great gift for the popcorn lovers in the family. They offer nicely priced tins, towers, and gift baskets which make it a savory option not only for your mouth, but for your wallet as well.